STAFFORD (October 3, 2018) – Monday evening around 5:30 p.m., Stafford police received a call about a car crash with a man thrown over the guardrail. According to the Stafford Police Department, the accident happened on the 13000 block of US 59 northbound. 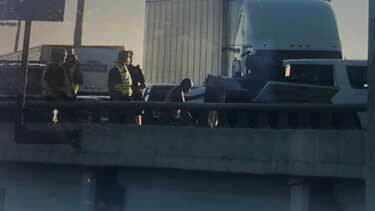 The man was tending to his car on the shoulder of the freeway when another vehicle collided into him. The man went over the guardrail and off the overpass landing on the grass. The man suffered extensive trauma to his leg and was taken to Memorial Hermann Hospital by Life Flight. Authorities have not released the name of the victim. There were several cars involved in the collision. An investigation remains open to determine what caused the initial car to crash into the man on the shoulder of the road. Police reports will be made available within ten days. At this time charges have not been stated for the at-fault driver. If you or a loved one have suffered a personal injury due to a car accident, it is important to contact a legal expert to help you evaluate your options. Call (713) 987-7111 or send us an email to discuss your car accident case.